In this quick tutorial I will show you how to create rounded corners in Photoshop using some simple masking techniques and filters. You can customize the corner radius to obtain a round edge corners for your shape, text, etc. It is a fast and simple method to create a round corner and you will obtain great results. You can use it for rounded corner photos using the result as layer mask. You can make rounded corners in Photoshop using this simple and quick technique. In the same way tou can make smooth edges in Photoshop. You can create a rectangle with rounded corners in Photoshop using the Rounded Rectangle Tool. Another shape that has rounded edges is the circle or the ellipse. But, Photoshop doesn't have a filter or other tool to create a round corner. Illustrator for example allows you to apply non-destructive rounded corners effect to pretty much any object. In Effects menu, simply choose Stylize > Rounded Corners. In this quick tutorial I will show you a simple method to apply rounded corners in Photoshop to text, shapes or any other raster image. One thing that you need to know is that we have to rasterize the text and shapes, so you will not be able to edit them after that. Let's start with a simple star vector shape with acute angles(it works great for right angles as well). Now you have to rasterize the shape; right click and choose Rasterize Layer. You will have to do the same if you use Text Layers. Go to Filter>Blur menu and choose Gaussian Blur. The radius of the Gaussian Blur depend on the size of your image and the result that you want to obtain. I will choose 5 pixels. Press CTRL and click on the layer thumbnail to make a Photoshop selection. Go to Select menu and choose Refine Edge with the following settings. You can experiment with Smooth and Feather options to see different effects. Leave the Contrast to 100. To bring back the Refine Edge in Photoshop CC thy the following technique. With the selection or mask active, press-and-hold Shift, and go to Select > Select and Mask. This will open the Refine Edge window instead of the Select and Mask Workspace! Pick the color of the shape, in our case yellow anf Fill the selection with that color. Press SHIFT+F5 to fill with color. The last step is to add this selection as layer mask and that is all. You have now a star shape with rounded corners. You can apply this technique for creating text with round corner as you can see in the image below. You can create your own customized font. If you want to save time you can try this automaded action for making Rounded Corners and Smoothing Jagged Edges in Photoshop with just 1-Click! 3 comment(s) for "Rounded Corners in Photoshop"
Here you have an useful tutorial for creating rounded corners in Photoshop using custom shapes. 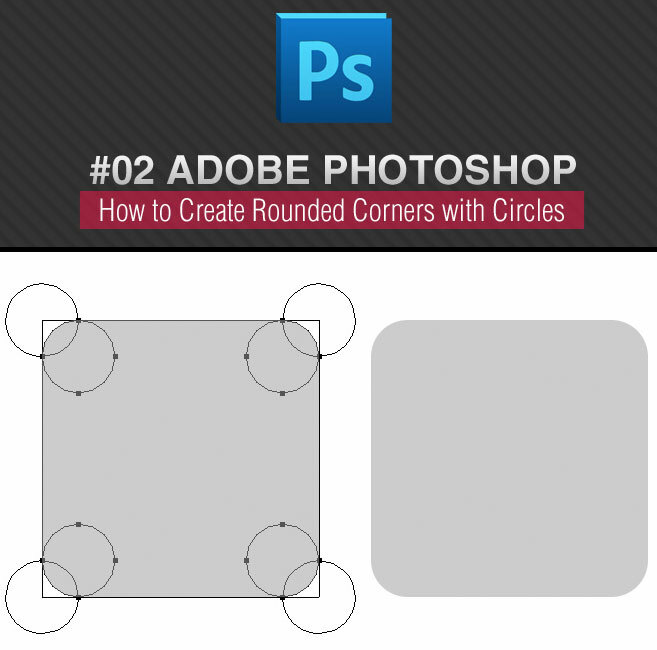 It is great Photoshop tip for making shapes with round corners.